Today I join more than 100 other bloggers in blogging against disablism. The intent is, by joining together in discussing discrimination still facing people with disabilities, we will bring the issue to the forefront yet again. Disablism n. discriminatory, oppressive or abusive behaviour arising from the belief that disabled people are inferior to others. Disablism is the British equivalent of the American term ableism used to describe discrimination against people with disabilities in favour of people who are not disabled. Ableism discriminates, devalues and denigrates the same as does racism and sexism. Ableism treats those without disabilities as the standard of “normal’, against which everyone is measured. Being a woman who has lived with cerebral palsy for forty years, I could share countless stories about how I have been discriminated against and treated “less than” by doctors, bus drivers, potential employers, and strangers. Discrimination, whether direct or indirect, is the main reason I chose the self-employment route. It’s not because I didn’t want the steady paycheque, the pension plan, or the friendly banter around the water cooler; it is because employers couldn’t get beyond their heebee-geebees about my disability during the interview process. One interview was at an inaccessible building (another form of discrimination), yet the employer blatantly refused to meet with me at a more accessible location. If he had determined I was the most suitable candidate and had offered me the job, Vocational Rehabilitation Services could have then stepped to assist in making the workplace accessible. By refusing to interview me, he did not permit me the opportunity to demonstrate my capabilities, skills and talents. I eased my hurt by convincing myself that he missed out on hiring the most meticulous and creative Newsletter Coordinator he ever would have had. But, in reality, the experience did (and still does) sting. I could go on and on about ways I have experienced discrimination and disablism (or ableism, depending upon which side of the pond you are on); but, really, where would that get us? What good is rehashing negative experiences? And, according to the Law of Attraction, focusing on negativity will only bring more â€“ that is something I can definitely do without! Rather than being against disablism, I’d rather be for inclusion. By focusing on what I want, rather than what I don’t, the Law of Attraction works in my favour. Being self-employed and working mainly in the virtual world, I can choose when and how much to disclose to clients. Many clients do not know the extent of my cerebral palsy; those who do know do not see it as a factor as long as I can do the work. We focus on the task at hand and my talents, expertise and passions are fully utilized; such a liberating feeling! If my disability doesn’t matter much online, how can we make disabilities less of a deal when face-to-face? How can we achieve an inclusive society? I’d love to hear your ideas. Let’s talk. I think one of the wonderful things about having an on-line existence is that folks can get to know you quite well before realising that you are “one of them”. Sometimes in face-to-face contact they see you’re disabled first (or read it on an application form) and you have to undo their preconceptions; on-line you can do it the other way round. And whilst man cannot live by web alone, every one person who gets over their heebbe-geebees on-line is another person who is less likely to have a problem with us in “real life”. I think you did a great job, and I am so glad to hear you have success in your own business. Working towards inclusion sounds more gentle to someone who finds fighting the fight tiring and quite frightening at times. Operating in a world where you are always made to feel on the periphery is hard, and then you have to work harder to change that negative perception from within yourself. I totally agree about postives and negatives though – we have to find the strength from inside in order to effect change among those we know, and in wider society. Your story is such an inspiration and eye opener to me. My daughters are both disabled (Down syndrome) but they are both very young. I strive each day to treat them like any other child with all the rules and regulations that go with that. I expect them to behave, I expect them to adhere to our family rules and they do! I don’t see my daughters as disabled. I see them as differently abled, just like you. stereotypes, misperceptions and assumptions about me. I need to get through all that stuff before we can get down to the reason for meeting. Working online enables me to control when and how to disclose. It is so liberating! One business associate is rather adamant that I provide all the gory details in the proposal, which, to me, is equivalent to the interview. I listen to her well-meaning advice, and then go ahead to write the proposal, focusing on providing the information the client requested. My business, my way! It is about independence, which is more a state of mind than a list of physical capabilities. Fascinating – yours was the first other BADD blog I’ve read, and we’ve both mentioned the Law of Attraction. Divine! I guess that’s the Law working. I realize that you were referring to your business, but I also feel that when you look at yourself as being (dis)abled that you are doing yourself & others a dis-service. You are placing even more limitations on yourself; even more than the dis-ability brings. People with (dis)abilities just have a different way of doing things. When one thing doesn’t work, we need to come up with a creative solution. Sometimes it’s looking at a problem in a different light…brainstorming until you find a suitable alternative. I have had rheumatoid arthritis since age 14. When I had my first child, I had a major flare. My whole body was under attack. My hands were in so much pain that I could not undo a velcro diaper tab on a disposable diaper. I needed to get creative or my daughter would have been in a soiled diaper all day long. I used my teeth! I was able to grip it enough to get the velcro started & then use my fingers. Wooohooo! Still difficult, but at least I was able to look after my daughter while my husband was at work. During that trying time, I needed to come up with new ways to care for my daughter without putting undo strain on my joints. 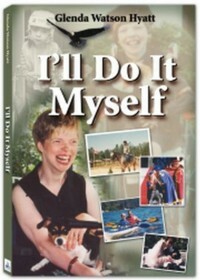 The hardest decision I made during that time was admitting that I couldn’t do it all on my own; and that I needed help. I think, in general, the public is intimidated/uncomfortable around (dis)abled people as they have not been around someone with a certain disability or they don’t know what to say. We can change this view point by sharing our (dis)ability openly & honestly. People only feel those heebee jeebees when we don’t take the time to educate/talk with people within our path. Just because we are different/(dis)abled does not mean that we are not unique or that we don’t have alot to offer! It’s all in how you look at it…. There has been change over the years, but there is still room for growth and acceptance. May we continue to look at a person’s ABILITY rather than his/her dis-ABILITY.